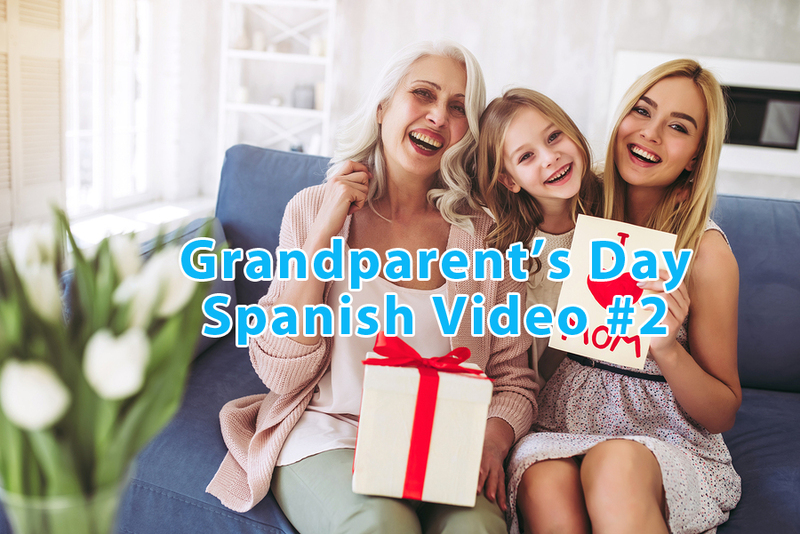 In this post, I have your second video of the 3-part series, Grandparent’s Day Spanish. I’m glowing a little (a lot) from the positive comments on the blog from video #1. I particularly enjoyed this comment from Shona. I am lucky enough to be able to share them with my tres nietos aged 12, 11 and 8 who are now learning Spanish at school in England. They spend a lot of time with us when we are in Tenerife where we live for part of each year. They appreciate the fun and up to date themes of your lessons and they give an extra dimension to their school experience. The traditional methods in schools can be very dry and dull. When kids have fun learning, it is a beautiful thing. I went from a distinction in grade 7 French to failing in grade 8. My grade 7 teacher, Mrs. Walker, brought the language to life. We followed her French instructions and point out all sorts of things in the classroom. I liked her, and I liked her class as it was engaging. Grade 8 was a new teacher. Her class was stationary, dry, dull and analytical. What a difference a teacher and a method can make. What a difference when you actually use the language. It seems so obvious when I type it. Yet so many classes never have you speaking. The Grandparents Day series uses the speak-to-learn system. Take a listen to the Spanish at the start of the video. It’s a preview of the Spanish in the lesson that has you speaking and understanding in 11 minutes and 31 seconds. I love your lessons and they make me use my brain when I feel in danger of becoming a lazy old person! Muchas gracias. Me gustan todas las lecciones y quisiera que es posible descargar estos videos para repetir. Pero bien, he comprado casi todos los cursos y estoy satisfecha y cada día un poco mejor. En todos los videos hay algo de aprender. Puedes decir algo de curso nuevo? Fearless fluency – he pensado comprarlo, auque ahora estoy en el Spanish Ear Training y el ultimo Bola de Nieve. He leido tambien que trabajas en uno nuevo curso que quizás llega en octubre – puedes decir algo de este curso? En que nivel es? !Marcus! ! !Tú eres lo mejor!! Gracias Marcus, Yo comprendo la lecion. Estoy muy emocionada! Me encanta . 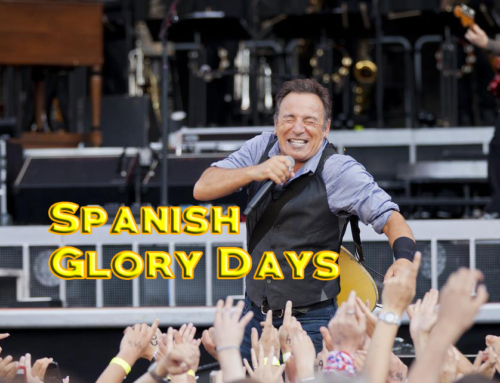 Speak to learn Spanish rocks! Hola Marcus – gracias por estos videos – me encantan mucho. thank you very much indeed for the excellent videos and the way you keep in contact with all of us. I am told that my Spanish is coming along very well. And it is so enjoyable to continue learning, again , many thanks and I always am extremely pleased to hear from you. my kindest regards to Ava and your good self . I look forward to your lessons each morning and appreciate these little extras you give us every so often. I am getting there but not fast enough to my taste; I will be practicing this week. I am getting there but not fast enough for me; I will practice more this week. Thanks for your comment. I totally agree with your fun approach which is so effective. I forgot to mention that my nietos particularly like the fact that Spanish reflexive verbs end in arse! Kids are the same the world over. Given an interesting lesson they absorb languages like sponges. I taught English as a foreign language in Paris for eight years and created a language school with a colleague. My daughter went to French school and after six months there at the age of seven was bilingual, covering her ears when my husband and I spoke our university French. Your approach is brilliant for any age group and is a pleasure to use. Thanks Marcos, as a grandparent this will prove useful. Progress is slow but steady. look forward to the next episode.